Nervous System Description | Your Guide to Healthy Living! The Nervous System plays a key role in everything you do, from walking to eating, even sleeping. In addition to the brain controlling your normal life functions, it provides your body the ability to cope with emergency situations. Your brain, like most vital organs, needs a good blood flow for sufficient oxygen and essential nutrients to work properly. If you are having problems to focus, there is possibility that the cells in your brain isn’t getting sufficient nutrition. Also, read my blog on 12 natural ways to improve focus and concentration. In caring for your brain, make sure that it gets sufficient nutrients to avoid illness that impede the flowing of blood to the brain. These illnesses, include high cholesterol, obesity, smoking, diabetes, poor kidney function, high blood pressure, etc. The description below helps you to understand the importance of the Nervous System and how the human system works. This helps you to make more informed brain health, eye/vision health, ear/hearing health and focus better supplements choices. Your diet alone could easily fall short in the supplying the nutrients your Nervous System needs to function optimally. The human Nervous System regulates the functions of all your body systems. Together with the Endocrine System, they are your body’s main control centers. Whereas the Nervous System uses nerve impulses to produce immediate body responses, the Endocrine System uses hormones to maintain long term body homeostasis and coordinate complex body processes such as fertility, growth and metabolism. The role, main functions and organs of this human body system are outlined below. The Nervous System is organ system that interprets sensory input and decide on body action. It gathers stimuli from the senses via the nerve network. The brain thinks it over and decides what the body should do in response, and then provides specific instructions to various body parts. Not only does the system parts manage your voluntary body functions, but also the involuntary body functions. Voluntary or conscious responses include skeletal movement. Examples of involuntary responses include regulating the cardiac muscle or activating glands. Sensory Function: Using, sensation the body’s Nervous System collects input/stimuli from sensory receptors on changes outside or within the body. Sensory neurons carry these messages to the brain using the nerves. The most common senses are sight, touch, taste, smell and hearing. Integration Function: The Central Nervous System(CNS) directs the received sensory input to various parts of the brain for processing. The brain then determines an appropriate response and generates the motor response. Motor Response Function: Once the motor response had been generated, the Nervous System sends response information throughout the body. Motor neurons carry these response impulses from the brain to move muscles and secrete glands. The major organs of the Nervous System are the brain, spinal cord, and sensory organs. Particularly, the sensory organs are the eye, ear and tongue. The Nervous System can be considered as a complex network of nerves and neurons that communicate signals between different body organs. A neuron can be defined as an excitable nerve cell that use electrical and chemical signals to receive, processes and transmits information. The diagram shows the main nerves within the human body. Central Nervous System (CNS) consisting of the brain and spinal cord that is the center of all you’re your thoughts and controls the activities of your body. 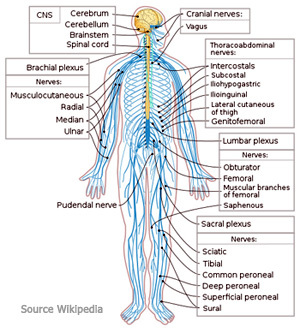 Peripheral Nervous System (PNS) is the nerve network that connects the brain with the all the other organs in the human body. The best supplements for the system are based on user reviews and will be continually updated. Please provide comments and submit your recommendations on supplements that work for brain health, eye/vision health and ear/hearing health by completing the form below. Focus booster supplements contains the vitamins, amino acids and other nutrients needed to improve focus.